If you are not refreshing your servers on a regular basis--about once every three years--then you are missing out on significant savings. You also improve your overall performance and agility. In fact, years four through six of your server's lifecycle can cost ten times as much as your initial server acquisition. 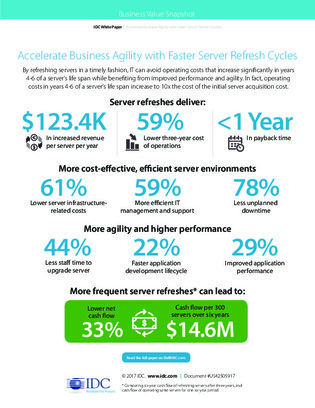 Access this IDC infographic to learn why you need a regular server refresh strategy in place. Download this infographic from Dell EMC and Intel® to learn more.